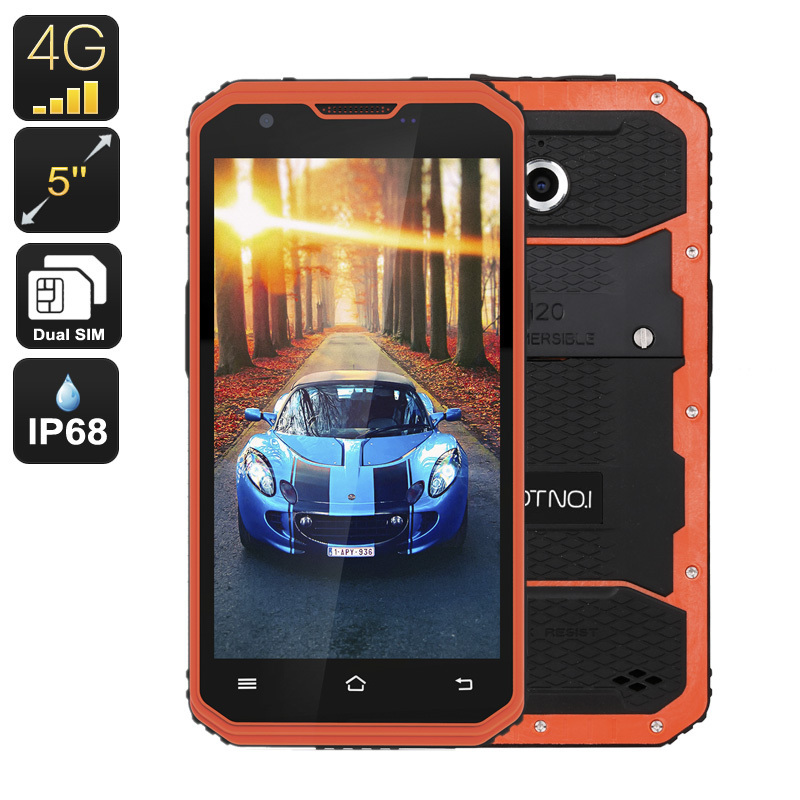 Successfully Added NO.1 M3 Rugged Smartphone - Android OS, IP68, 5 Inch Display, 4G, Dual-IMEI, Quad-Core CPU, 2GB RAM, 13MP Camera (Orange) to your Shopping Cart. The NO.1 M3 rugged smartphone is the perfect device for those of us that work in tough environments or simply love to spent time in the outdoors. Featuring a fully rugged design this Android phone is well protected against bumps, drops, and any other sort of impacts. Its IP68 classification additionally makes this phone resistant against water, dust, and a whole lot more – allowing it to work properly in the harshest environments. Its rugged design has been topped off with a beautiful 5-inch display that portraits all media in stunning HD resolution, letting you enjoy movies, games, and apps no matter whether you’re at home or in the outdoors. Along with its Android operating system, this Chinese smartphone is guaranteed to deliver a smooth and powerful overall user experience. With its Quad-Core CPU and 2GB of RAM, the NO.1 M3 rugged phone holds some serious hardware that is capable to get you through the most demanding of multitasking sessions and mobile media imaginable. Whether you like to enjoy an HD movie, play the latest games online, or simply browse the web and use multiple apps simultaneously – this tough smartphone handles whatever you throw at it. Coming with 16GB of memory and the added possibility to increase it with another 32GB externally, provides you with more than enough storage to save all your favorite files and media alike that can now be carried along in your pocket wherever you go. Featuring Dual-SIM card slots and two IMEI numbers, this 5-inch smartphone significantly increases your connectivity by allowing you to be connected to two 4G network providers simultaneously. Not only does this make your NO.1 M3 smartphone the perfect device on which to separate work and private life, it also allows you to have broader global data coverage as now you’ll always be able to throw in a foreign SIM card and be connected to the local network while traveling abroad. With its 4G connectivity you can be assured that, no matter where on the globe you’re located, you’ll always be able to enjoy the fastest data speeds out there. Packing a 4500mAh battery, this Android smartphone lets you enjoy all its features for 4 hours continuously – offering plenty of time to get through the most demanding of days. With a 72-hour battery life on standby, the NO.1 M3 smartphone can be conveniently carried along on your next hike or outdoor adventure without you needing to worry about battery life. In order to enjoy your upcoming trip even more, this Chinese phone also packs a 13MP camera that allows you to snap stunningly beautiful pictures of all those special moments in life. With its massive battery and mesmerizing camera you can be assured that, with the NO.1 M3 at hand, you will never again let a moment or beautiful landscape pass by uncaptured. The NO.1 M3 rugged smartphone comes with a 12 months warranty, brought to you by the leader in Android phones as well as wholesale electronic gadgets..
Great looking, fast starting. I wish it would've connected in the USA. The frequencies matched, but it never connected. I got a full refund though. This is a great website to buy from. Does not work in central USA. This IP68 version is a beatifull phone, comes with the newest version of Android, have an excellent camera resolution, GPU allow user to record and play high quality photos and videos, and better yet HD Movies, phone core is well protected, storage is plenty enough for documentos, images and special for games, the 4500 Mah battery make the usage phone more longer, radio bands are availible for my country, so this interesting to me, have two sim card slots, for me is nice because i manage two services for diferent mobile services, its delivered with a year warranty. This is cool, High quality, with cool specifications and great looks. It is a good rugged smartphone for us to go out. recommended it.